Enticing, healing, romancing, and influencing; they are one of nature’s most precious gifts–and are cherished by many. (Myself included). I like to think I experience the world first through scent, and then by sight, sound, taste and touch. Most people have a sense that they are most aligned with, and mine definitely is my sense of smell. I have a deep appreciation for aromas of all kinds, sometimes even offensive ones… Alternately, I am deeply effected and affected by smell and most often by synthetic ones. A natural progression for me in my love affair with anything olfactory was/is to explore the vast world of essential oils. With so many different applications, effects and options to chose from, there is a lot to learn. One thing I have truly enjoyed doing with them is making sprays of all kinds. Particularly body sprays. I do a basic recipe for body spray which includes witch hazel, distilled water or hydrosol/flower essence, glycerin, and essential oils. I like to use witch hazel for its healing and refreshing properties, but vodka can also be used, if you can spare it. (Just kidding). Glycerin is great for moisturizing but also helps the oils retain their scents on your skin. 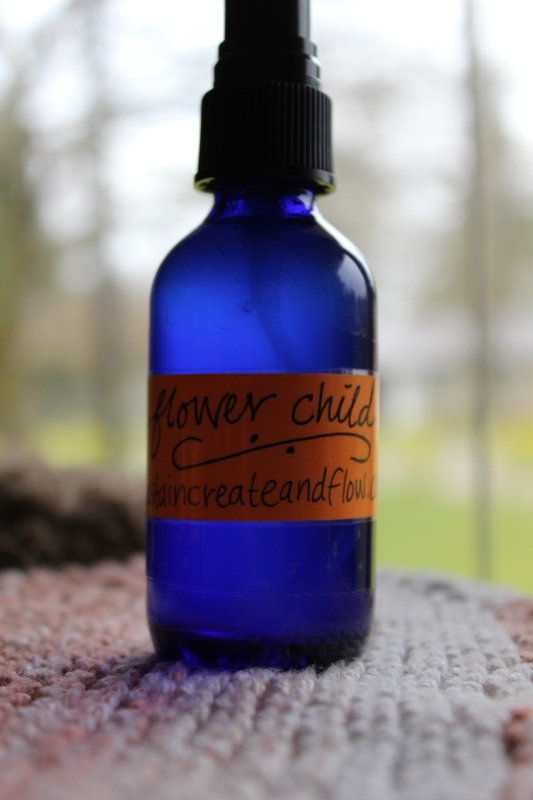 Hydrosols/flower essences are more fun than plain water and carry additional scents and healing benefits as well. (If you are not familiar with hydrosols, a crude definition of them is “a very weak essential oil.” They are a product of the distillation process and are suitable for many applications when an essential oil would be too strong. My favorite, and most widely known hydrosol/flower essence is rosewater, which has been used historically for perfumes and many other body care applications and culinary uses as well). 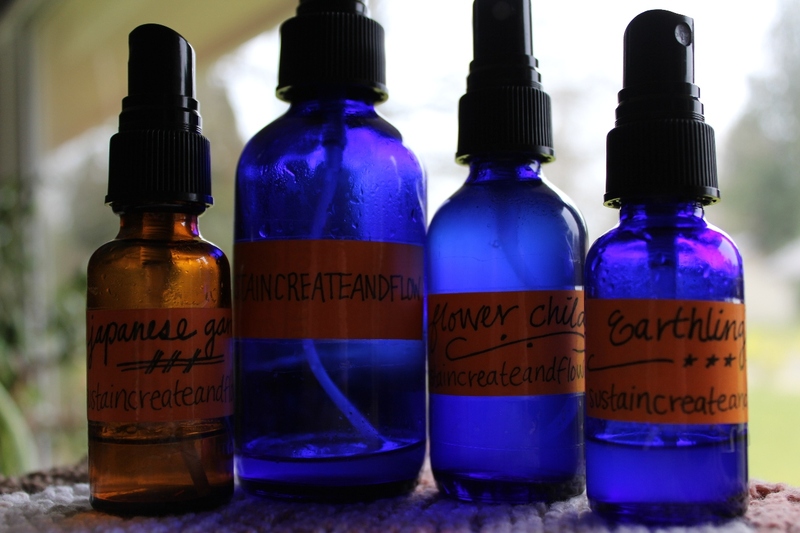 Herbal body sprays are easy to make, but don’t have a crazy-long shelf life. Since the ingredients are easy to come by, fairly inexpensive, and have a multitude of uses around the home, you don’t have to be judicial with their use. I like to use mine to clean my yoga mat, spray my pillow for added relaxation, for perfuming my hair, clothes and skin, for making bug spray and hand sanitizer and for other miscellaneous aroma-therapies. I usually make a 2-4 oz. bottle because I like to have a bunch of different scents to choose from at once. I recommend using glass bottles, because the essential oils may cause a plastic bottle to leech. Yucky. The method is simple, just gather ingredients, funnel into a bottle, shake, and spray. Pick your favorite scents and combine them to create endless combinations. These make great gifts too. It was a scent-sation! Admittedly, the ylang-ylang was a bit overpowering, and next time I might try to go just a touch lighter on it, like maybe just 8 drops instead of 10. Do you have a favorite combination? Share it with us in the comments below! Are your essential oils listed in the order of how much you would use each. I get headaches from too much smell testing and also tend to overdo it with my recipes. Are your ess oil recipes listed by the amount you would use? ie: 15 peppermint, 10 swt orange, 5 lime? I had an awful experience with lemon and basil, which smells much better on the plant than as an eo. These are great. We have a link party called Wednesdays Adorned From Above Blog Hop and would love to have you share this and any other posts with everyone. It runs from Tuesday night through midnight Sunday. Here is the link to the party. We are also having a giveaway this week for a $50.00 Target Gift Card, so head over to enter. These look wonderful! I can’t wait to make some. Your labels are awesome, too. I have a collection of essential & fragrance oils purchsed within the last 7months or so. I intended to use them in blending & experimenting fragrances for a perfumery business I’m hoping to own in the future. I never knew that some essential oils do expired in 1 yr. I have invested a great amount of money into them. I feel helpless that all this investment may be going down the drain soon. Help! Would adding both Witch hazel and vodka help improve the shelf life? Thank you so much from another sensitive sniffer! I just made a spray in a 2 ounce bottle — using just under 2 ounces distilled water, 1 tsp vegetable glycerin and 1/2 tsp of Sweet dreams (bergamot, tangerine & lavender essential oils) and a “dash” of clary sage. I don’t want to ruin the batch but i’m not sure I smell me?? LOL! It is cool/refreshing but not sure if its strong enough but too afraid to waste more oil and ruin it…or have too strong of an oil combo and have a reaction….any advise for first timer?